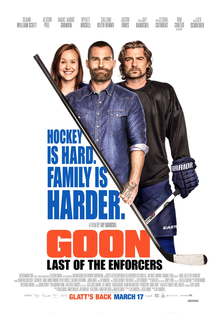 Goon: Last of the Enforcers is a 2017 sports comedy film directed by Jay Baruchel in his directorial debut and written by Baruchel and Jesse Chabot. A sequel to Goon (2011), the film stars Seann William Scott, Baruchel, Liev Schreiber, Alison Pill, Elisha Cuthbert, Callum Keith Rennie, Wyatt Russell, Marc-André Grondin and Kim Coates. During a pro hockey lockout, several top players are now playing in the lower league. Doug “The Thug” Glatt has just being named as the captain of the Halifax Highlanders and with media focus has descended on the lower league, and the owner of the Highlanders, Hyrum Cain (Callum Keith Rennie), seeks to capitalize on the attention. In a close fought game, Doug is goaded into a fight with the rival team’s enforcer, Anders Cain, an up-and-coming player with a violent streak, and the son of the Highlanders’ owner. Anders wins the fight, and with Doug badly injured, the Highlanders lose the game. With a busted by shoulder, Doug retired after a party in his honour and goes to join a more stable job as an insurance firm in their supplies section. 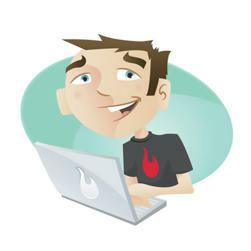 Doug’s wife Eva is pregnant and they both prepare of the birth and life as new parents. Without Doug, the Highlanders go on a long losing streak, prompting the owner to push for changes. He signs several overseas players and pushes to add his own son to the team. Hyrum foresees Anders as the new captain of the Highlanders, and although the coach disagrees with the move, anticipating locker room dysfunction, Hyrum strong arms him into making Anders the new captain. Doug is missing the game and his Highlanders and goes to his old rival now friend Ross “The Boss” Rhea, who has left hockey and now competes in a hockey fighting league, where he is the current champion. Ross agrees to train with Doug to strengthen his left arm for fighting Ross convinces Doug that if he joins the hockey fighting league and impresses, it could be a way to get back into minor league hockey. Doug takes Ross’ advice, but the first fight ends up being a battle royale style brawl, instead of the one-on-one fights that Doug had witnessed before. Ross is exhausted at the end as only he and Doug are left standing and is helped to the changing room by Doug. In the locker room after the fight, Ross reveals that he has post-concussion syndrome, and doctors have recommended that he stop playing, as one more bad hit could cause a permanent injury. At the same time, the Highlanders have improved with Anders as the captain, but not enough to get into playoff position. Anders’ self-sabotaging play, in which he constantly is being penalized for fighting, has kept the Highlanders outside of a playoff spot. He also has antagonize the rest of the squad and their play suffers as a result. During another losing effort, Anders grows frustrated and ends up knocking out the entire opposing team. He is promptly suspended, and the coach demands a change. Hyrum, having seen Doug fight again, brings Doug and Ross back in. Eva makes Doug promise that he won’t fight and supports his return to hockey. the Highlanders narrowly win in Doug’s celebrated return. The Highlanders go on a winning streak, but when Anders returns from suspension, he goads Doug into being more aggressive. Doug and Anders interrupt a game during a dispute, and they are both suspended for the next game. During the game’s afterparty, Anders provokes Doug into a fight, and when Eva sees that Doug has been fighting again, she kicks him out of the house. Meanwhile, the Highlanders must win the last two games of the season to sneak into the playoffs and Hyrum also sacks his own son Anders who promptly rejoins Reading, his old club. While Ross helps the Highlanders to win the first of their last two games, Eva goes into labor, and Doug reconciles with her as they head to the hospital. After having her baby, Eva realizes that the same drive that led Doug to be with her during the birth, is the same drive that pushes him to want to defend his teammates on the ice, and she gives Doug her blessing to continue fighting. Doug returns to the Highlanders in their final league match vs Reading. The game is immediately chippy, with both Ross and Anders starting fights.As the game enters the third period with the game tied, Ross and Anders are involved in a scuffle, and Anders cheap shots Ross, checking him from behind into the boards. Ross is knocked unconscious, and while paramedics take him away on a stretcher, Doug enters the rink to fight Anders in retaliation. Doug uses his southpaw training to beat Anders, but when Doug shows mercy, Anders threatens Doug, claiming that he will never stop coming for him until they are both like Ross, being carried out on stretchers. Realizing that his new family is more important to him than hockey, Doug uses his weakened right arm to level Anders, but throws his arm out and has to be helped off the ice. Hyrum rushes to his son’s aid, where Anders tells him that he hates hockey, and the two appear to mend things between them. Having been told earlier that further injury to his right arm would be career-ending, Doug realizes that his hockey days are behind him. He watches as the Highlanders win the game in the final seconds, and during the celebration, he sets his stick down and goes home. The ending is actually spectacular and sad and yet celebratory. He chooses his son and wife to a sport he loves. Although it’s not great, there are some really fun moments. I love ice hockey and this movie just strengthens that love. 7.5 outta 10!